The PinCode Keypad is integrated into the System 3060 without wires and opens any component by radio when the correct 4 to 8-digit code is entered. With its transparent ring, this ultra-flat, flush-mounted keypad goes with any setting. 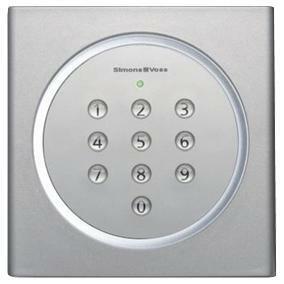 The keypad is mounted near the door – inside, outside, and even on glass surfaces. The keypad can be set in a special VdS shunt lock mode, enabling it to be used for the simple arming and disarming of an alarm system. The PinCode Keypad has a dual-stage battery warning system, which announces the need to change the battery in good time. To protect against misuse, an acoustic alarm sounds for one minute if an incorrect PinCode is entered five times.